Digital transformation does not happen automatically. Visiolink aims to enlighten news media on how to increase ePaper penetration, and develop their digital presence. 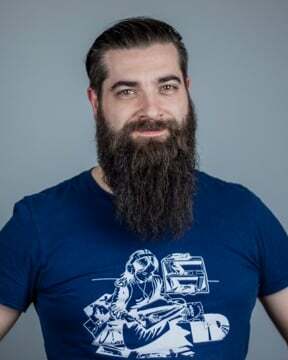 So how do you attain readers to the ePaper platform, and just as importantly how do you retain them?One method of increasing readership and help develop the digital revenue strategy is to introduce print free days. The use of print free days can be relevant for all media organizations with a physical distribution channel. One or more days during the year on which the newspaper is only released digitally. This encourages subscribers to try out the ePaper. Our analysis shows positive trends in the amount of both publication downloads and openings, after having effectively implemented print free days. The analysis is based on two different newspapers, who have successfully executed the strategy of having print free days. 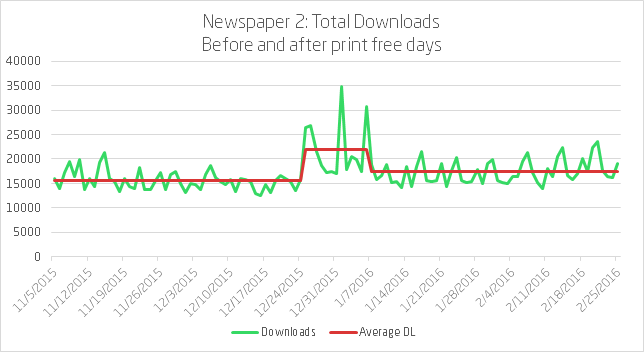 To illustrate the importance of a marketing effort, we looked at a third paper that forget to communicate their intentions.The two newspapers both decided to have their print free days during the winter holidays, and both saw a permanent increase in their digitally baseline readership. 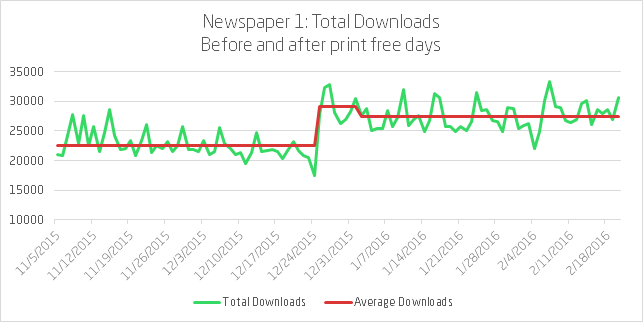 Newspaper 1 saw an increase of 21,5 % in their downloads, and Newspaper 2 experienced an increase of 11,4 % downloading the newspaper digitally. Data samples have been extracted for 50 days before and 50 days after the print free days. To show a more consistent and reliable effect, we excluded the print free days. This prevents a misleading result from the high number of downloads on these days. However, this effect cannot be achieved without effective marketing. The two papers in question, had both effectively communicated the print free days in advance. The communication effort is extremely important, otherwise print free days can backfire and leave readers frustrated. 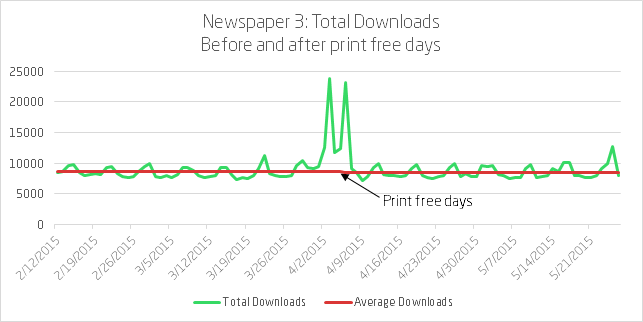 Although the newspaper experienced a rather big increase in downloads on their print free days, there was no permanent effect to their baseline readership. In fact, they ended up experiencing a decrease in downloads by -1,07 %. Readers need a heads-up in advance. Set up a schedule of print free days, and utilize an additional focused front page on the physical newspaper the day before to help develop the reader’s transformation to the ePaper. Visiolink BI (formerly Visiolab) offer to track new users downloading and using the ePaper for the first time. This allows you to follow your subscribers development over time, and see how many continues to read the ePaper in the following months. This service is especially useful for measuring the effect of a targeted marketing campaign. And for exploring possible strategies to help minimize churn.